The ashes of a mystery woman found washed up on a beach in December have been scattered at sea. Mayor of Christchurch Lesley Dedman found a casket with the name Audrey Maguire engraved on the plaque during a dog walk at Mudeford in Dorset. After considerable lengths to trace relatives failed, Ms Dedman decided to arrange a service for Ms Maguire. 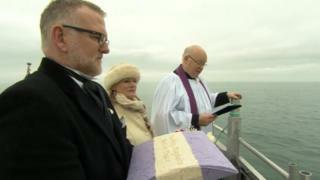 The ashes were scattered following a special ceremony held on the Mudeford Ferry. Ms Dedman said: "Now she's where she should have been." The Reverend Canon Charles Stewart said it was a privilege to be involved in scattering Ms Maguire's ashes. He said: "When you've got somebody that, despite all the searches that have happened, has no obvious family who could be here, we wanted to do the very best that we could for her." Following the discovery of the wooden casket on 23 December, Ms Dedman placed the ashes under a tree in her garden with flowers on it. She then made extensive efforts to track down Audrey Maguire's next of kin via online appeals and checks with funeral directors. But after nearly three months, no one had come forward. Ms Dedman has been given the coordinates where the biodegradable parcel urn was dropped into the sea off the Christchurch coast, should any family come forward in the future.